There’s just something about paperbacks from the 1950s that makes them stick out from their later cousins. In general 50s paperbacks tend to have fewer words on the cover and a somewhat more somber color palette or else a bold flat color with a more design-oriented composition. I should admit that my frame or reference here is limited, as I have fewer 50s paperbacks in my collection than other decades (and only a fraction of those are online). But still, I manage to correctly guess that a given book is from the 50s more often than not. It’s a gift. 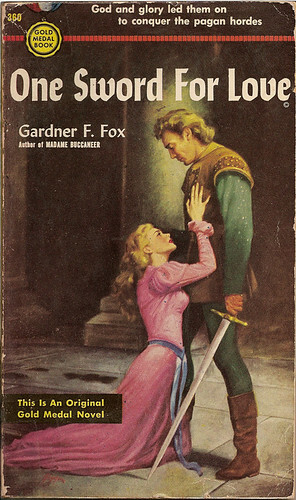 The present specimen, One Sword for Love is an historical romance by Gardner F. Fox, one of the most influential and creative authors of the early comics. Fox essentially invented the idea of a team of super-heroes in the form of the pre-War Justice Society of America, and then reinvented the team in the Silver Age with the Justice League of America. He did the same with his heroes the Flash and Hawkman. He also created DC’s planetary romance hero Adam Strange, Batman’s utility belt, the concept of the multiverse, and dozens of other contributions that last to the modern day. He is, as they say, a Big Deal, but his fiction remains mostly forgotten today. Is it any good? In the case of One Sword for Love I have no idea, as I just picked it up a couple of weeks ago. I have read Fox’s planetary romance (The Warrior of Llarn) and his Conan ripoff character, Kothar—Barbarian Swordsman. Both books contained considerable charm despite their origins as derivative hackwork, and as I think back on them the things that stand out most are the sheer wild ideas. The Llarn book involves a bodiless godlike intelligence trapped in a sphere of null-time who drags a man across the cosmos. Kothar involves a particularly interesting encounter with a lich and levitation magic that I’ve never seen before. On one level they’re simple John Carter and Conan pastiches, but the “little” big ideas Fox sneaks in makes them stand out from the rest. The lich in Kothar, by the way, is probably the original source that inspired Gary Gygax to include the creature in early editions of Dungeons & Dragons. There’s probably no undead wizards in One Sword for Love, but the book is about the mythical Christian king Prester John, so it’s bound to be entertaining.